The manager reporting feature gives managers visibility of expenses they’ve reviewed and the ability to create custom live reports and insights of their team's expenses. 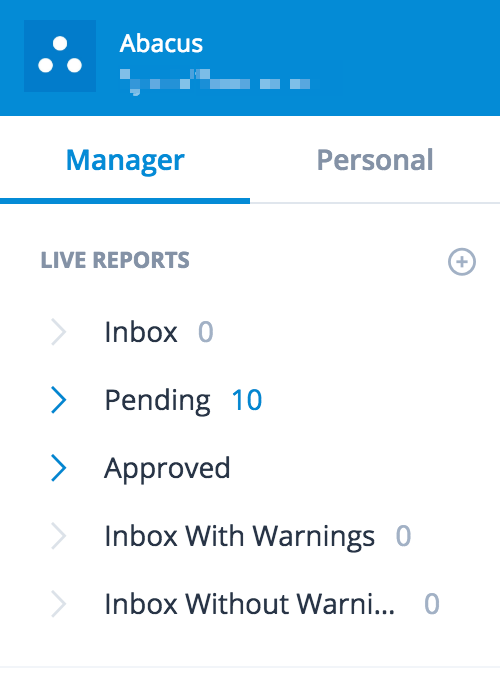 As a manager, not only can you view expenses awaiting your approval in your ‘Inbox,’ you also have visibility and reporting abilities for expenses that are in the ‘Pending’ or ‘Approved’ sections. Inbox - All expenses awaiting your review. Approved - All expenses that have been given final approval by an Admin. Custom - Use the advanced filter function in Abacus to create and save custom live reports that will update in real-time. In addition to live reports, managers can filter their teams' expenses and use the Insights feature create charts and graphs for an at-a-glance view of expenses. Visibility - What expenses can I see as a manager? As a manager, you will have visibility of expenses submitted by anyone on your team from the time you are set as their manager. * You will also see your own expenses in the 'Pending' and 'Approved' sections. This is to ensure that you can most accurately report on your teams spend. *Expenses that skipped or bypassed a manager's approval will only be visible if the expense was skipped or bypassed on September 18th, 2018 at 12:00pm onward.